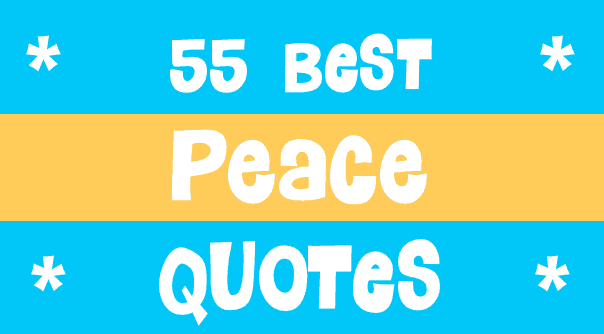 We started with our 55 favorite peace quotes, but we extended it quite a bit. Enjoy. It’s not enough to win a war; it is more important to organize the peace. The best weapon is to sit down and talk. What kind of peace do we seek? Not a Pax Americana enforced on the world by American weapons of war. Not the peace of the grave or the security of the slave. I am talking about genuine peace, the kind of peace that makes life on earth worth living, the kind that enables men and nations to grow and to hope and to build a better life for their children . . . not merely peace in our time but peace for all time. Peace does not rest in the charters and covenants alone. It lies in the hearts and minds of all people. So let us not rest all our hopes on parchment and on paper, let us strive to build peace, a desire for peace, a willingness to work for peace in the hearts and minds of all of our people. I believe that we can. I believe the problems of human destiny are not beyond the reach of human beings. If there is a mystical chord in democracy, it probably revolves around the notion that unexpected music can resonate from politics when people are pursuing questions larger than self… I have seen that ennobling effect in people many, many times— expressed by those who found themselves engaged in genuine acts of democratic expression, who claimed their right to define the larger destiny of their community, their nations. This is the true joy in life, the being used for a purpose recognized by yourself as a mighty one; the being a force of nature instead of a feverish, selfish little clod of ailments and grievances complaining that the world will not devote itself to making you happy. I am of the opinion that my life belongs to the whole community, and as long as I live it is my privilege to do for it whatever I can. I want to be thoroughly used up when I die, for the harder I work the more I live – I rejoice in life for its own sake. Life is no brief candle for me. It is a sort of splendid torch which I have got hold of for the moment, and I want to make it burn as brightly as possible before handing it on to future generations. I am poor and naked, but I am the chief of the nation. We do not want riches but we do want to train our children right. Riches would do us no good. We could not take them with us to the other world. We do not want riches – We want peace and love. I see the world being slowly transformed into a wilderness – I hear the approaching thunder that, one day, will destroy us too. I feel the suffering of millions. And yet, when I look up at the sky, I somehow feel that everything will change for the better, that this cruelty too shall end, that peace and tranquility will return once more. I speak of peace, therefore, as the necessary rational end of rational men. I realize the pursuit of peace is not as dramatic as the pursuit of war… But we have no more urgent task. Hobbits are an unobtrusive but very ancient people, more numerous formerly than they are today; for they love peace and quiet and good tilled earth: a well-ordered and well-farmed countryside was their favourite haunt. There is a higher court than courts of justice, and that is the court of conscience. It supersedes all other courts. If you want to end the war then Instead of sending guns, send books. Instead of sending tanks, send pens. Instead of sending soldiers, send teachers. Violence is impractical because it is a descending spiral ending in destruction for all. It is immoral because it seeks to humiliate the opponent rather than win his understanding: it seeks to annihilate rather than convert. Violence is immoral because it thrives on hatred rather than love. It destroys community and makes brotherhood impossible. It leaves society in monologue rather than dialogue. Violence ends up defeating itself. It creates bitterness in the survivors and brutality in the destroyers. To replace the old paradigm of war with a new paradigm of waging peace, we must be pioneers who can push the boundaries of human understanding. We must be doctors who can cure the virus of violence. We must be soldiers of peace who can do more than preach to the choir. And we must be artists who will make the world our masterpiece. Peace does not mean an absence of conflicts; differences will always be there. Peace means solving these differences through peaceful means; through dialogue, education, knowledge; and through humane ways. Love is the vital essence that pervades and permeates, from the center to the circumference, the graduating circles of all thought and action. Love is the talisman of human weal and woe –the open sesame to every soul. More than just an end to war, we want an end to the beginnings of all wars.